Careentan.com: Number 76 Style- Kérastase Sensidote Calming Ritual Scalp Treatment! Number 76 Style- Kérastase Sensidote Calming Ritual Scalp Treatment! Wheee finally I'm able to update on this! 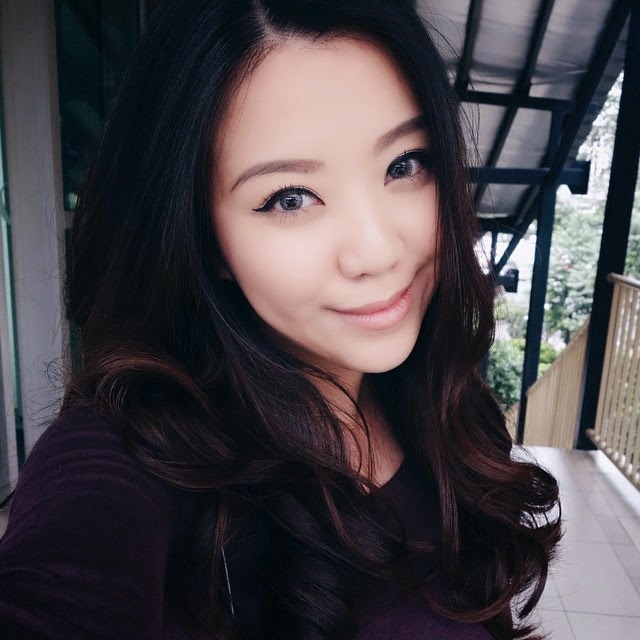 Was invited by the Number 76 Style salon to try out their hair/scalp treatment at the Mid Valley branch in KL about a week ago, which was timely cos it was just before the sister in law's wedding! If I actually visited Number76's website, I would't have made such a blunder! So I finally arrived and was excited for my hair treatment! The Number76 headquarters was located right beside the Mid Valley branch. One of their team members, Sue Ann came over from the office during her lunch break just to say hi. So nice of her! The full menu of hair services available. Kérastase products on full display. I personally loved the design of the Number 76 Mid Valley branch. It's minimalist, simple, clean. Just the way I like it! Here's yours truly before starting the hair consultation and treatment. From the surface, my hair looked fine and healthy. But you'll be surprised to know that I struggle with dry ends and dreadful scalp problems! You'll see why shortly. 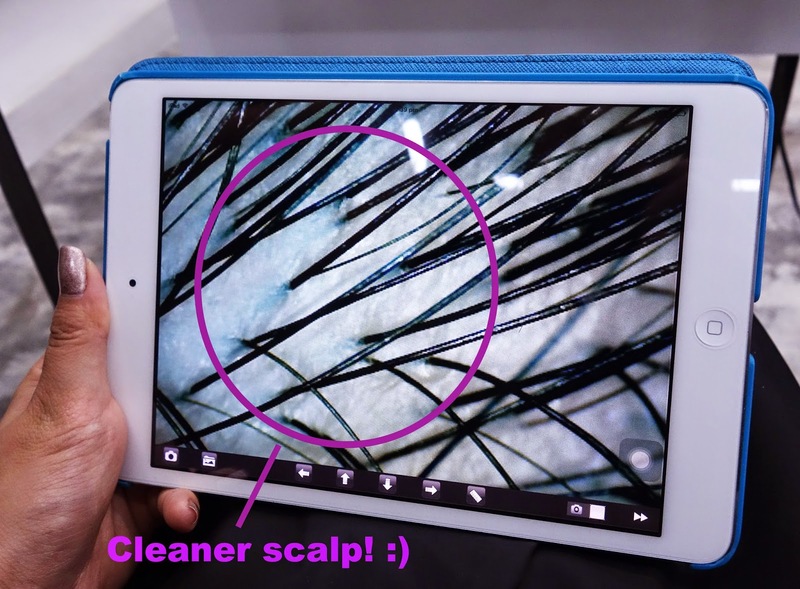 So we started with a close-up scan for my scalp, using a mobile scanner and an iPad! ...I got to view it live on the iPad! I've always been seeing these hair pictures on hair loss advertisements all over billboards and newspapers, and never thought that one day I would get to see my own scalp up close this way! I was honestly pretty amused! While we were doing the scan, Emily explained various conditions of my scalp on different parts of my head. From the photo above, you can see little flakes stuck in between my hair. Those were dandruff flakes and other oil, dirt and sebum found on my scalp. Emily also said if these dandruff and overproduced sebum were not removed and cleansed regularly, in the long run they would reside on my scalp permanently and block new hair from growing out of my scalp. Which is one of the reasons how some people experience balding and hair loss! So scary! 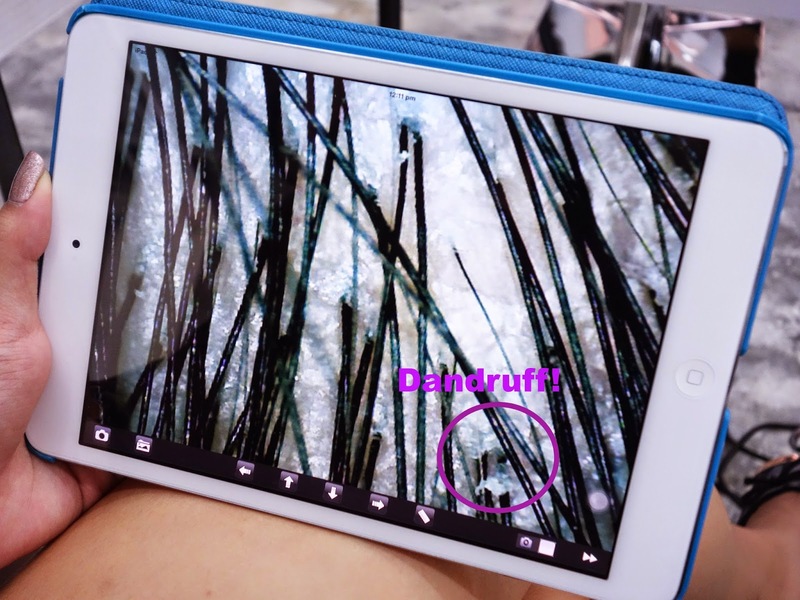 I always thought dandruff were just small matters that almost everyone has, and never thought that there would be big consequences if I don't rid them! And FYI, I washed my hair the night before my visit and I was there at noon time, so my hair was considered "clean" and scalp "fresh". Well, apparently not! Can you imagine if I did the scan after two days of not washing my hair? Oh gosh. And jeng jeng jengggggg. These red, bloody-looking spots on my scalp were open wounds caused by scratching! You know how we sometimes scratch our scalp when it's itchy, or when we use our fingernails to wash our hair? Apparently it's a huge no-no because our scalps are that sensitive! 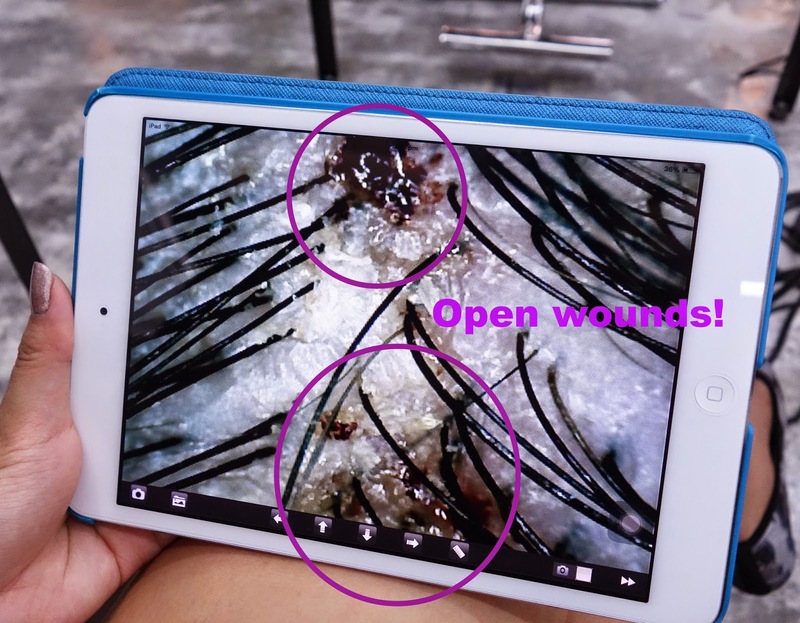 And if we over-exerted the scalp with our fingernails, it causes open wounds that look like the photo above. These were the products used for my scalp treatment that day! I went for the Kérastase Sensidote Calming Ritual treatment, which works mainly to sooth and calm discomfort on sensitive scalps while increasing scalp tolerance against external aggressions. The soothing formula helps reduce itching, redness, tingling and the burning sensation that those with sensitive scalp may be familiar with. This treatment essentially prepares the scalp with the best condition to grow healthy, strong hair. So right after the scan, Emily arranged for me to have my hair washed. I was given the option to go for the Tansan Sparkling Scalp Wash with an additional fee of RM30, and I said yes! I really want to cleanse my scalp thoroughly. More popularly known as "tansan spa" in Japanese, this scalp care wash is one of the most popular services in Japan that has been brought in specially by the Number76 team. This simple scalp cleansing wash can be done over the basin within just a few minutes. 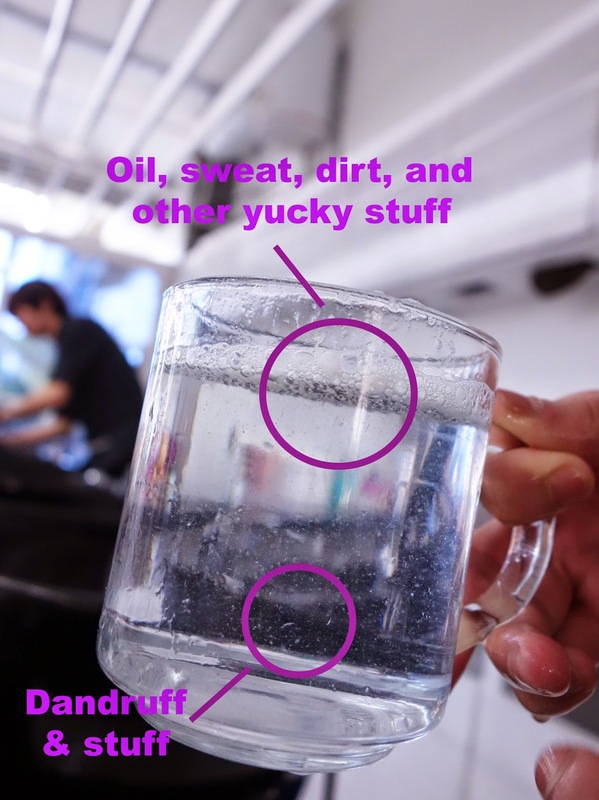 Soda gas (or carbon dioxide) is added into the water and as the water rinses out, it works effectively to remove dirt and excess oil from the scalp and silicon from your hair. Our scalp and hair immediately becomes clean and fresh, the optimal contain to promote healthy hair growth. Taddaaaa. This was the water scooped up after my Tansan Sparkling Scalp Wash. The top foam layer consisted of oil, sweat, dirt and other yucky stuff, while the tiny flakes found floating in the water were bits and pieces of my dandruff. Ewwwwwww! Felt so fresh and clean after my hair wash! Now it's time for the scalp treatment! Sensodite Dermo-Calm scalp treatment by Kérastase. They were massaged into my scalp, left for a while for them to sit in, and then rinsed off. After another hair wash, more Kérastase products and serums were massaged into my hair and scalp before blowing dry. We did another scalp scan after my hair was blown dry, and they've looked much cleaner and healthier now! Of course the red spots were still there and those would need consistent scalp care and treatment to heal and improve. After the visit, I learned a lot more about the health of my scalp and have become more careful with how I treat my scalp, like not using my fingernails to scratch it! Wheeeee! Could instantly feel that my scalp were more soothed and relaxed after the treatment, not as tense and irritated as before. For those of you who're wondering how much my scalp treatment cost, here are the details! 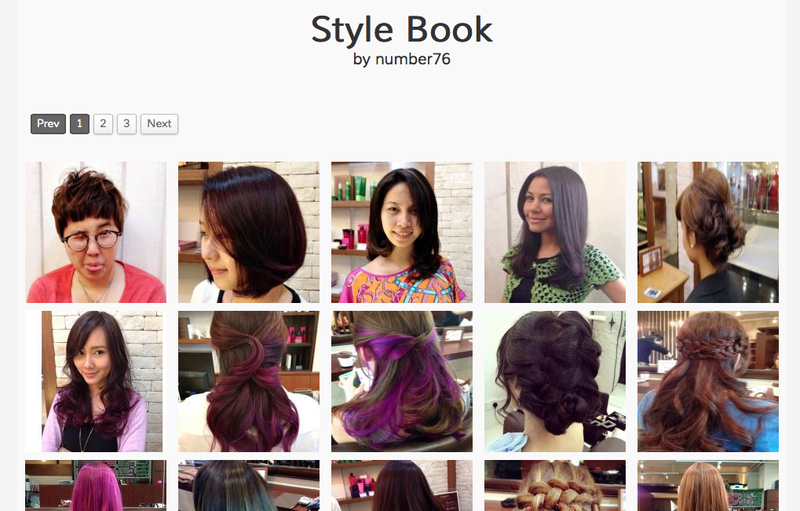 For additional information, you can visit Number76's official website at www.number76.com where they have various features that might interest you, such as the Style Book where you can view all their past works, and perhaps find some inspiration on what hairstyle to go for next! You can also make a booking with them online!